We have a fine tradition in sports. We have earned a reputation for success in intercollegiate competitions and tournaments, sometimes teaming up with other engineering colleges. Many of our students also participate at the state and national level competitions. 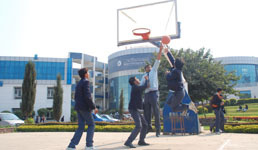 RGI has state of the art sports infrastructure that includes- international level basket ball ground and cricket ground; and facilities for in-door games including- billiard table, table tennis, badminton, carom, chess, etc. to name a few. The university recognizes RGI’s commitment to sports and has awarded it with the rights to organize state-level and nodal-level (Bhopal) cricket tournament.